On 11/16 Chris Cady of MoDNR posted a comment correcting some errors in this post and making additional clarifications. I have gone through the post to correct the errors. Please be sure to read Cady’s comment at the end of the post. 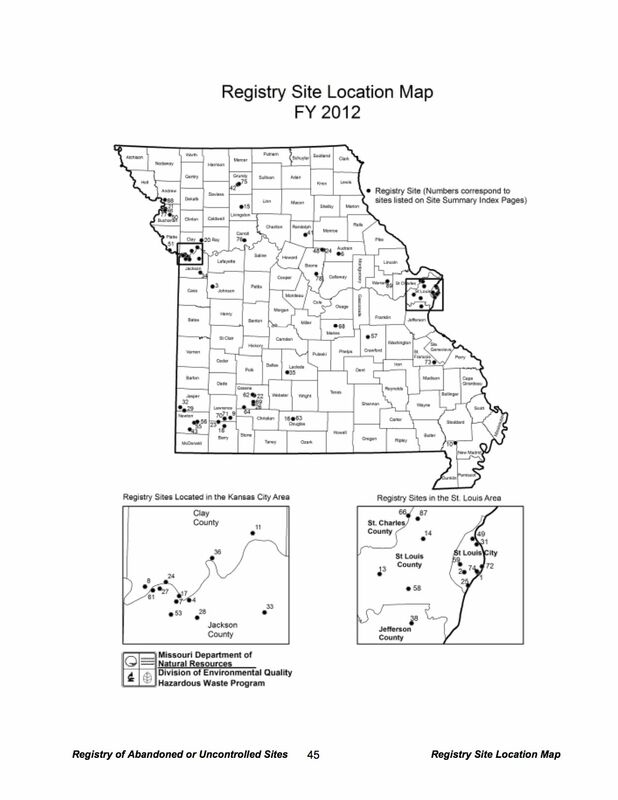 In the last post I reported on the National Priorities List (Superfund) sites in Missouri. Those sites tend to be the worst of the worst: physically large, badly contaminated, and the greatest threats to health and the environment. But they are just the tip of the iceberg. There are other seriously contaminated sites that don’t quite reach the same level of threat as do the NPL sites. In addition, there are also brownfield sites. These are smaller sites; though they may contain very toxic waste, and there are many more of them, each one individually represents less off a threat. Also numerous are underground storage tanks (for instance below ground gasoline tanks at a gas station) that represent environmental threats. Figure 1. Source: MoDNR 2017a. Under the same law establishing the NPL, Under state law, the Missouri Department of Natural Resources (MoDNR) maintains a Registry of large, badly contaminated hazardous waste sites in the state. The list is published each January in the Missouri Registry Annual Report. This post concerns the report for FY 2016, published January, 2017. Figure 1 maps the sites in the Registry. The sites on Missouri’s Registry overlap with the sites on the active NPL, however each contains sites that the other does not. Figure 1 maps the sites in the Registry. sites that are causing or presenting an imminent danger of causing irreversible or irreparable damage to the public health or environment – immediate action required. sites that are a significant threat to the environment – action required. sites that do not present a significant threat to the public health or the environment – action may be deferred. sites that have been properly closed – require continued management. Data Source: MoDNR 2017a, MoDNR 2013. Table 1 lists the number of sites by classification. The single Class 1 site is already on the NPL, while 3 of the Class 2 sites are on the NPL. 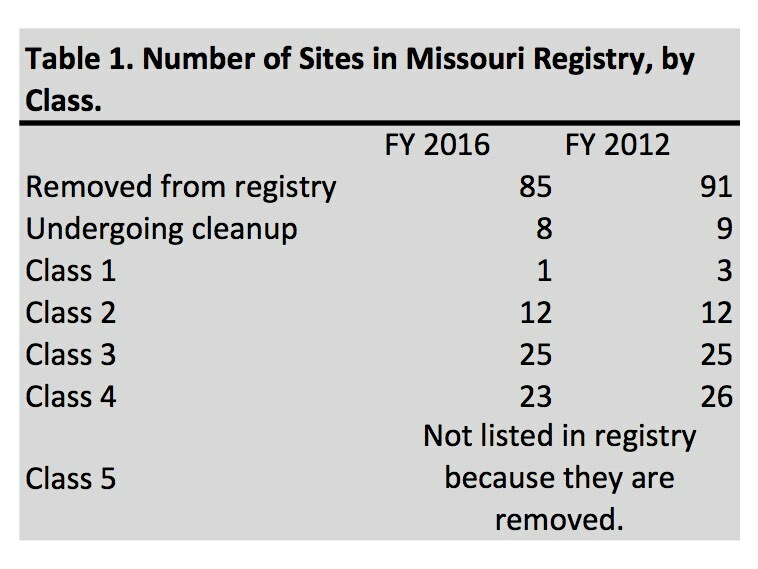 Like the Superfund sites, the sites on the Registry do not change quickly. Several of the sites on the NPL were previously listed in the registry, but have since been removed (e.g. Times Beach, Fullbright Landfill). Some sites on the NPL are not included in the registry, nor are they listed in the sites under remediation or those that have been removed (e.g. the Compass Plaza Well in Rogersville). What this means, I’m not sure. This list of exemptions is illustrative, not comprehensive. Waste from some of these sources is covered by other programs, either federal or state, but I don’t know the specifics. Thus, there may be many more large, seriously contaminated hazardous waste sites that are not included in the Registry. In a previous post I have reported the existence of the E-START mapping utility available through the DNR’s website. It may be the most comprehensive resource of contaminated waste sites in Missouri. I will refer to it again in the upcoming couple of posts. In the next post I will discuss brownfield sites. Missouri Department of Natural Resources (MoDNR). 2017a. Missouri Registry Annual Report. Downloaded 9/22/2017 from https://dnr.mo.gov/pubs. Missouri Department of Natural Resources (MoDNR). 2017b. Superfund – Registry. Viewed online 10/29/2017 at https://dnr.mo.gov/env/hwp/sfund/registry.htm. Missouri Department of Natural Resources (MoDNR). 2017c. Operating Units (Superfund Division). Viewed online 11/3/2017 at https://dnr.mo.gov/env/hwp/sfund/operatingunits.htm. Missouri Department of Natural Resources (MoDNR). 2013. Missouri Registry Annual Report. Downloaded 2013 from http://www.dnr.mo.gov/env/hwp/sfund/sfundregistry.htm. By mogreenstats in Land, Pollution - Land on 2017/11/09 . Thanks for your great work. I have a couple of comments on this page. The Registry was actually established by state law. It is maintained by MoDNR’s Superfund Section but it is purely a state program. It is not a list of large, badly contaminated sites; there are sites that are larger and more contaminated than many on the Registry. The law (for better or worse) limited the listing to sites with RCRA Hazardous Wastes (listed or characteristic). It was primarily intended to prevent property transfer without the buyer being aware of contamination, and to control changes in property use that may put occupants at risk. Other methods have come along to provide public information, such as the E-START interactive online map. As you alluded to, RCRA Haz Wastes represent a limited universe of contamination with specific definitions, and a site can be contaminated to an unsafe level without the contaminants being haz waste. Although the ‘exempted’ list is quite revealing, it might be good to describe what constitutes a RCRA Hazardous Waste. PCBs are regulated under TSCA and EPA oversees cleanup of PCB spills. However PCBs also occur at some Superfund and Brownfield sites and they are included in the lists of contaminants addressed by those programs. Petroleum products, exempted from CERCLA, are regulated by the Tank Section if they are from regulated tanks (i.e. gas stations). Many brownfield sites have petroleum from other sources – old pre-regulation gas stations, pipelines, junkyards, unregulated tanks, etc. Radionuclides and coal tar are CERCLA hazardous substances (as are PCBs) so can be addressed under Superfund or Brownfields. Mining waste is commonly addressed under Superfund – MO has entire counties that are NPL sites because of historic lead mining. Chris, thanks so much for your clarifying comment. I wasn’t able to find a brief document that described the information in your comment. If you know of one, I would be glad to post a link to it for my readers. I think they would be interested in how all these programs fit together.